Promoting your company or brand online has never been easier, thanks to a wide variety of WordPress business themes. Nowadays, it is pretty much essential to have a website created for your business. You do need to be online. Otherwise, your potential customers might doubt in you and start looking for similar products and/or services elsewhere. Sure, a few years back it was very pricey to get a website build from scratch, and many could not afford it. With the help from WordPress, you can have your site up and running in just a few clicks at a very low cost. You do not even need a programmer, you can do it all on your own. Pick up a specific demo you fancy, add a logo, some company pictures and text and you are pretty much good to go. Not to mention, how time-consuming it was to get a corporate website made ten, heck, even five years ago. A business owner does not really have much time to spend on building a site, yet, it is super crucial to have an online presence. Promoting your business on the web is important, especially having a mobile responsive layout of your website. Let’s face it, everyone is on their smartphones in this day and age. That said, we handpicked a collection of the best WordPress themes for business. Going on a hunt on your own can take you a lot of time before you decide which to choose. There are a ton of themes out there and most of them are very good, meaning, it can be a real struggle deciding which to go with. We are here to help you save a ton of time and did all the hard work for you, picking only the best themes for you. Neve is a powerful multi-functional WordPress theme which you can use for a vast assortment of different purposes. No need to feel limited in any way, shape or form. That said, make sure that your imagination is not stopping you. With Neve, you can go as creative and complex or as simple and straightforward as you would like. Neve is also a solid WordPress business theme that will help you bring your firm to the online spice and thrive. Do your thing, integrate blog for content marketing and link your page to your social accounts. All this and a whole lot more, you can easily accomplish with the impressive Neve theme. With Engage, you will excite and engage all your visitors and have them hooked forever. 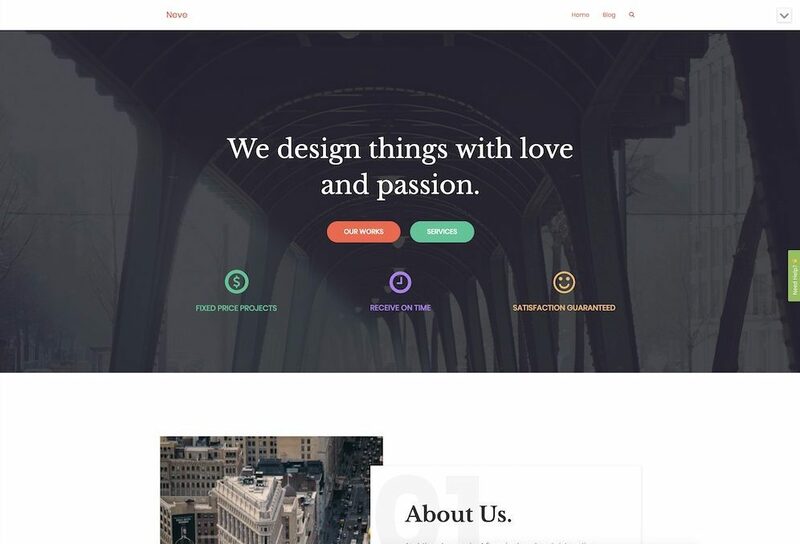 It is a killer WordPress business theme for crafting responsive and mobile-ready websites regardless of the niche you are in. Engage is one of such themes that almost instantly adapts to your industry and is ridiculously easy to edit and adjust. With the bundle of over thirty ready-to-use samples, and more coming your way with future updates, you can speed up the process of building your dream page. At any time, you can also alter the demo of choice and even come up with custom layouts. A lot is possible with the impressive Engage. Sleek and feature-rich, the Simple Business WordPress Theme offers multiple page layouts and sliders (including Revolution Slider! ), FontAwesome icons, responsive design, hundreds of Google Font options, and more! 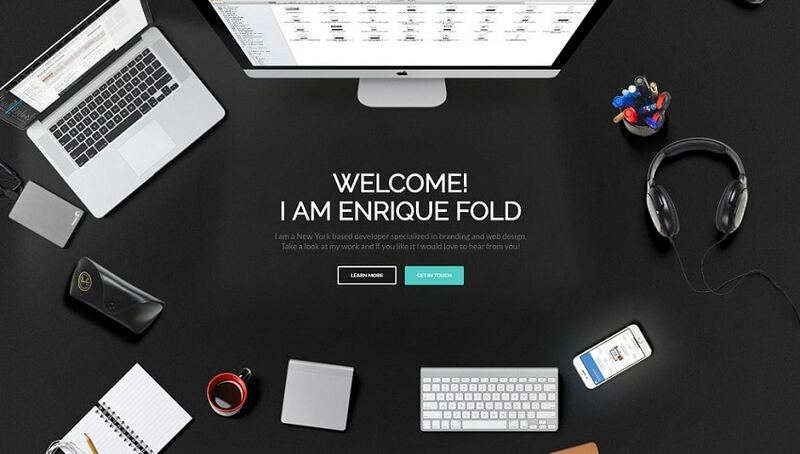 Needless to say, Enfold is one of the best selling WordPress themes ever created. With this theme, you can build a website quickly and have your online presence going strong right away. With countless demo options and new ones constantly created, they could be of good use as your starting point. No need to start building and customizing from scratch, pick what you fancy, and you are nearly done. 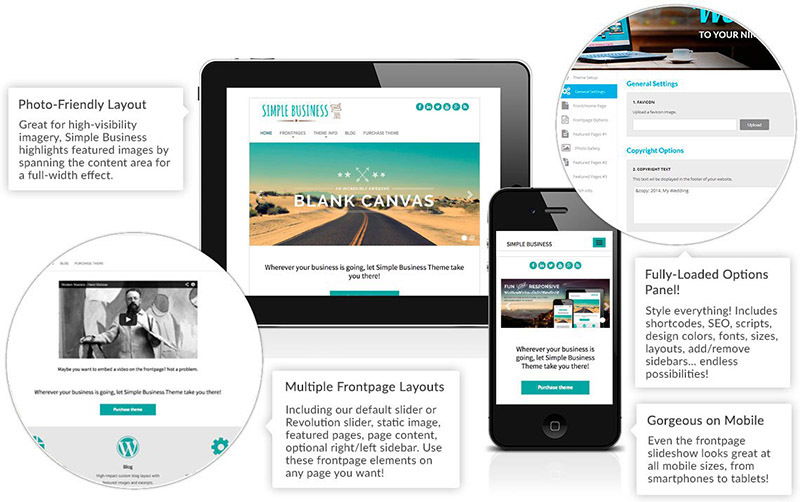 It is an extremely flexible, responsive and retina ready WordPress theme for your business. With its extensive documentation, you will not have any problem creating the web page all on your own. 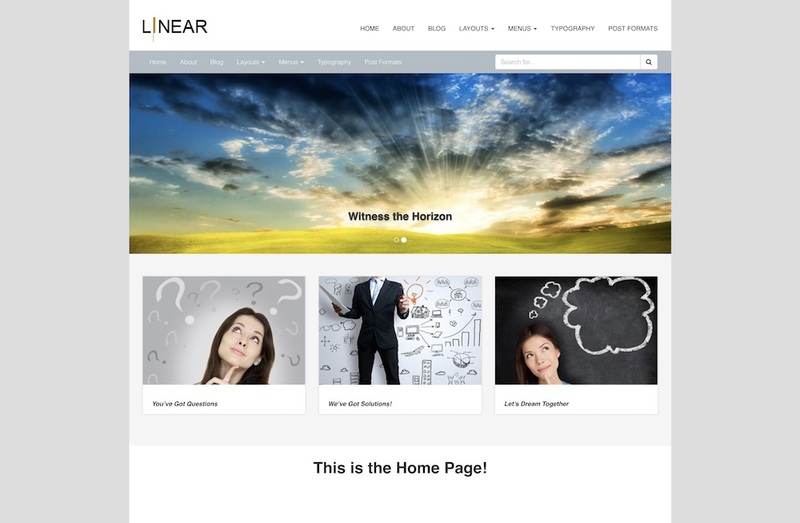 If you are looking or a free WordPress business theme, you better check out Pixel-Linear. It is a modern, clean, responsive and cross-browser site canvas that will get you going online in no time. You can either use it as is or you can improve and enhance it further so it matches your branding needs and regulations. Pixel-Linear has many customization functions and widgets to add or remove from the web design. As a result, you can now effortlessly create a professional web space for your business, agency or even freelancing business without the need to spend a single penny. Whatever the case, do the right thing with Pixel-Linear and skyrocket your potential. With consulting WordPress theme, you can pretty much create a website for any service providing business. Easy customizable with drag and drop page builder will allow you to quickly change your site’s features if needed. With business, financing and consulting in mind, it is the perfect option for a company in any of these niches. You can use special features, graphs, pie charts and progress bars, to showcase your case studies to your clients. 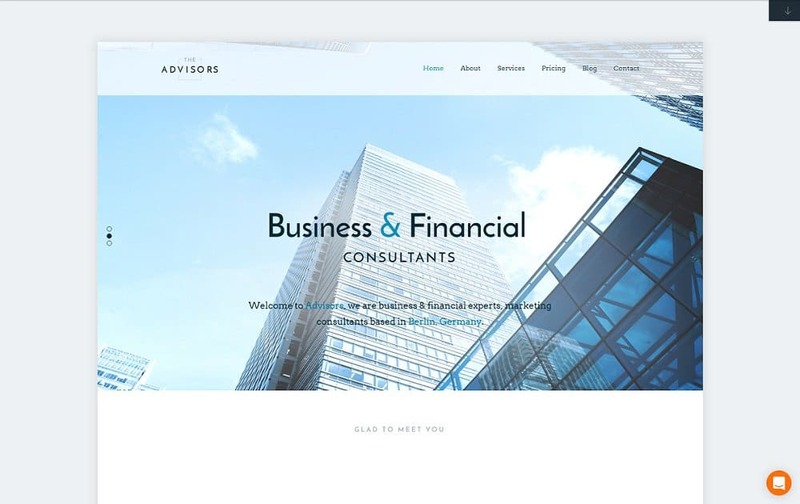 Take their breath away with your professionalism, using this stunning and modern business, financial and consulting WordPress theme. Meet The Advisors by ThemeFuse: A professional business WordPress theme for The Core (multi-purpose theme package). 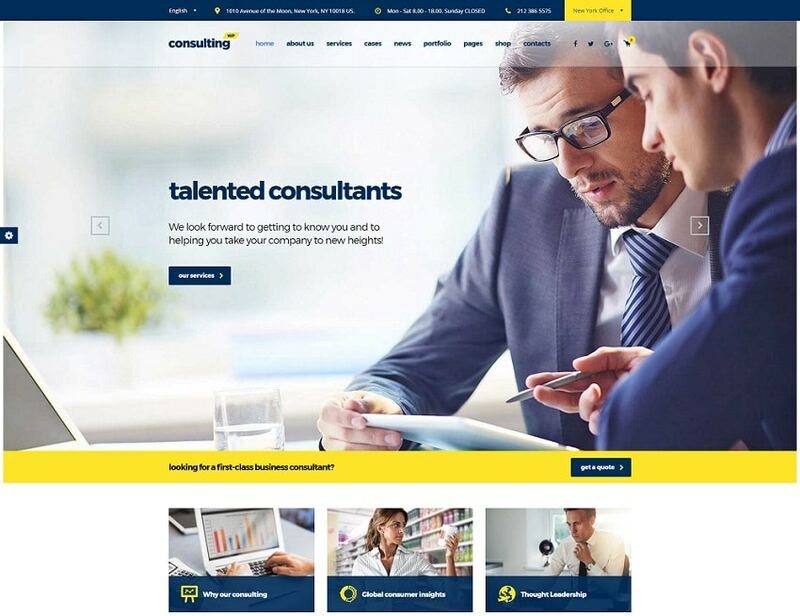 This theme works nicely for service provider agencies and consulting business. The package gives you a range of different page templates with custom layouts. Hence, you can choose to display your core services, price plans, team details and business information in a proper way. A business website should be able to create online presence in a professional way. And that’s what you will be doing with Advisors WordPress theme. 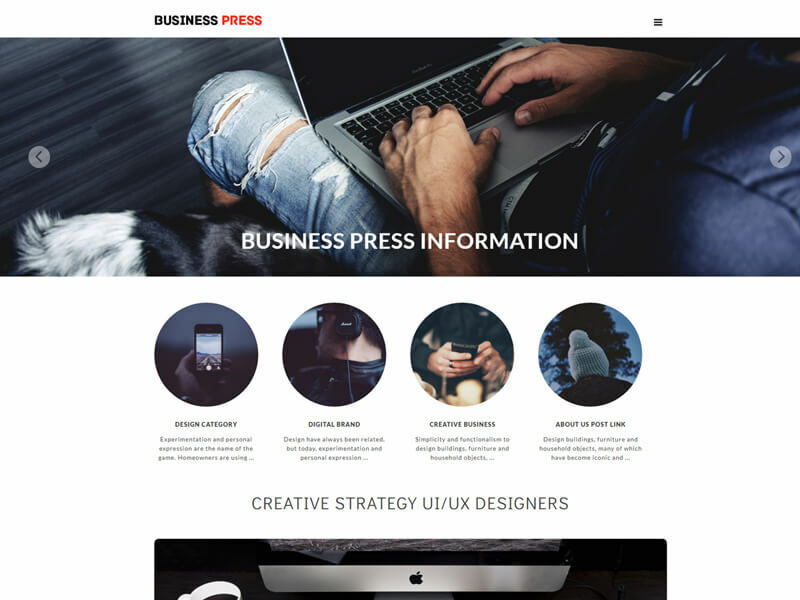 Business Press is a highly customizable WordPress theme developed primarily for freelancers and business individuals. However, it can also be used for startups and small to medium sized organization websites. With build in responsive slider and clean navigation menu, this theme is perfect for any business owner looking for a modern and elegant site. Easy to setup and customize, fully responsive and amazing support. With the version 2 of the design-driven multipurpose WordPress business theme, Unicon offers so much more compared to its previous version. It includes everything you need to create a beautiful, fully responsive and retina ready design. Moreover, go as detailed as you would like and take its features to your advantage to build an outstanding website for your business, agency, portfolio or online shop site. 10 additional innovative page builder options, new page layouts, new animated elements and form styles and a whole lot more is what you get with Unicon. A WP theme packed with goodies for your beautiful new website. Creat a business website at the speed of lightning using the Jupiter WordPress business theme. With its easy drag and drop feature, you will have your page up and running in no time. A few extra touches and you are set for success. To make your life even easier and to save you even more time, pick your favorite from the 100+ pre-made templates. Install with a click and start customizing straight away. What makes Jupiter multi-purpose theme as fast as it is is a modular architecture and advanced memory management. A bunch of innovative features that will help you stand out from the crowd. 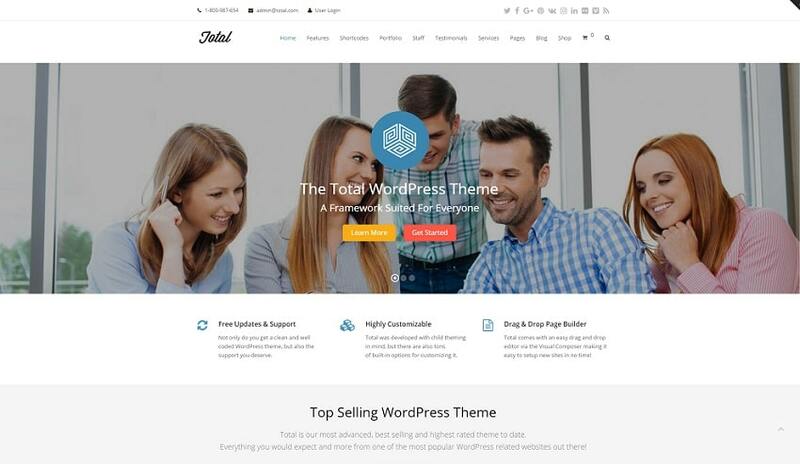 No need to think twice why it is called Total WordPress theme. Whenever you wish to change your website, either you don’t like it anymore or there is a special reason for it, Total can totally do it all. With a wide variety of features, live customization and drag and drop builder, you can do pretty much whatever you like with your website. To be completely honest, once you go Total you never look back. Go ahead, give it a go and you will see how much you get for just $49. 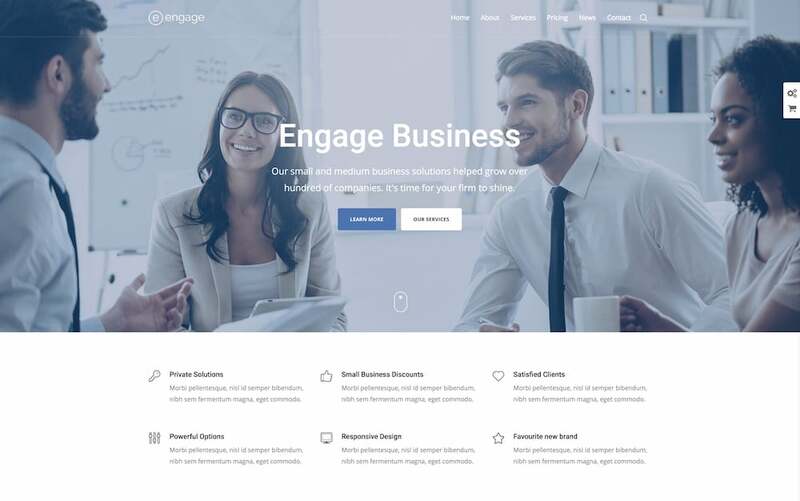 Hence the name, Business is a neat and professional WordPress business theme with a solid assortment of supreme features and assets. Give your company a face on the web with Business and make it help you gain new project deals and thrive. In barely any time, you can have a fully functional page up and running, attracting new clientele. Do not miss the tremendous amount of opportunities the internet can bring you with a quick and efficient execution of a website thanks to Business. It is all there, at your fingertips, ready for you to put it to use and customize it however you see the best fit. 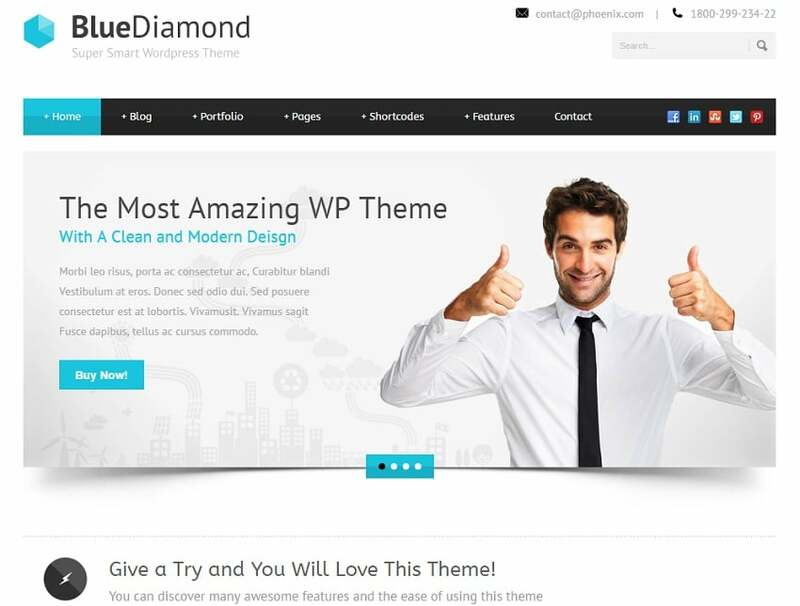 A clean, minimal and modern WordPress theme just like Blue Diamond is might be everything you need for your business. No need to add too many stuff to your website. Have it distraction free and build it with UX in mind. The user-friendly admin panel along with Page Builder and Layer Slider will allow you to customize the theme with ease. There is just about anything that you can think of that you can customize. Not to mention, with the live color changer option, you can quickly change your site and make it stand out from the masses with a unique color scheme. 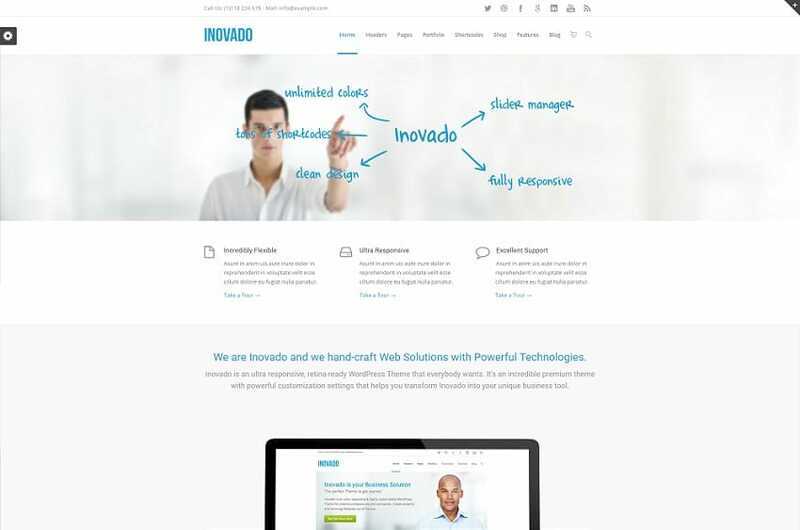 With a massive amount of satisfied users, Inovado is a WordPress theme for business that you cannot go wrong with. A versatile theme with plenty customization options and fully responsive and retina ready design. It works fluently and looks stunningly on any device you and your customers use. With its advanced admin panel, tons of helpful shortcodes and other whatnots, Inovado does not disappoint. Not to mention, you also get some of the popular and highly needed premium plugins for free when you purchase the theme. 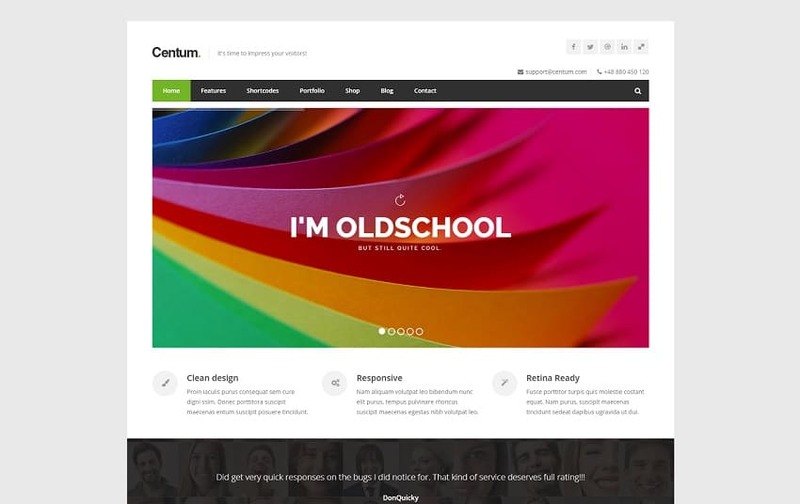 Centum is a 100% responsive premium WordPress theme perfect for corporate and portfolio websites. It comes with all the special features you need when it comes to putting together an outstanding business website. 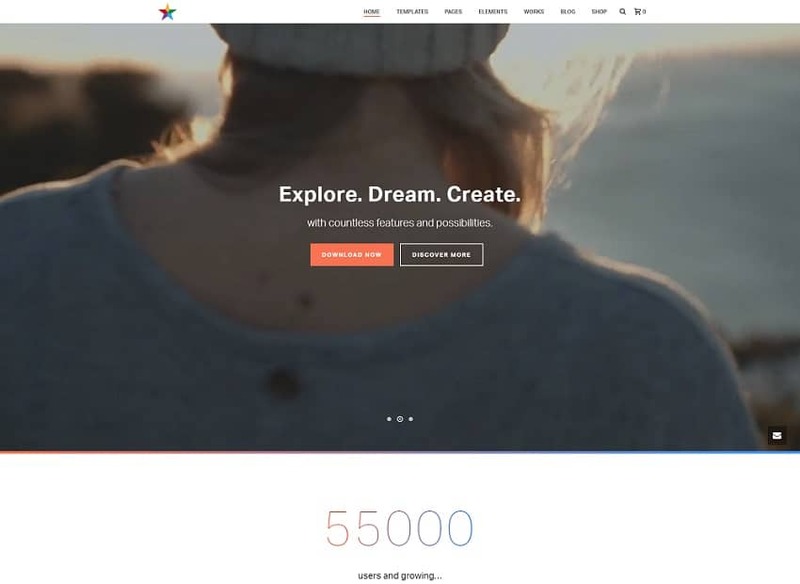 With Revolution Slider, you can truly inspire your visitors and with the overall professional looking site attract new potential clients and turn them into new prospects. It is all so simple and so easy to work with and all thanks to the powerful Visual Composer. The drag and drop page builder helps you create unique layouts and customize them to your likings. Are you a startup who is in need of a fresh WordPress theme? If that is you case, you just stumbled across the perfect solution for your business. With Startit, you can start hammering out a compelling website for your biz without sweating too much. Startit comes with 21 different home pages to choose from, several demos and a ton of features you can take to your advantage. 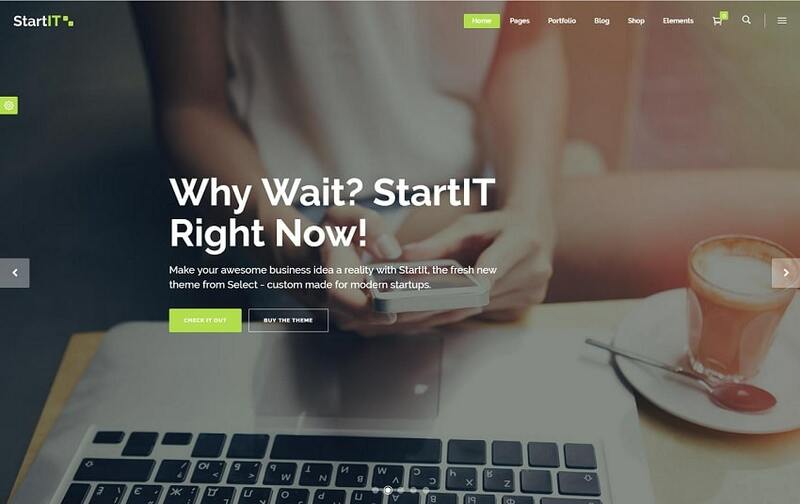 Perfectly suitable for any type of technology startup, Startit will kick your online presence off in next to no time. All the hard work has already been done for you. The only thing left for you to do is to put your creative mind do its magic. 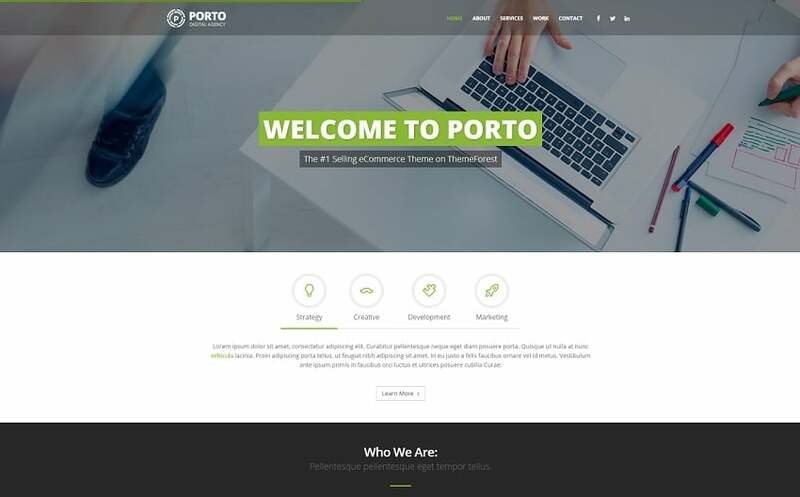 Porto is a multifunctional WordPress business theme with an answer to every question and concern you may have. So much goodies the theme comes with, you will almost feel overwhelmed in the beginning. Just take it slow and step by step and all the rest will follow in the exact same order you fancy. Creating any type of business with Porto is easy as pie. And to make you life even easier, yet show the world your professionalism, pick a predefined demo which already has everything built for you. You just need to add personal touches to it and you are ready for the launch. 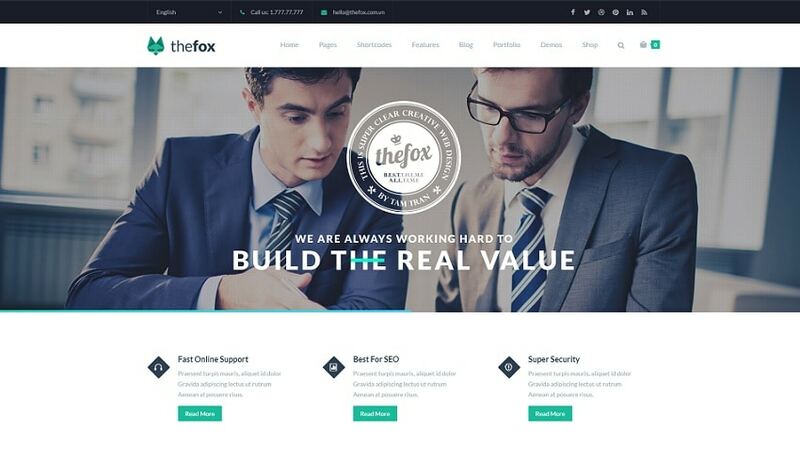 With a clean and flexible design, responsive and retina ready, TheFox is an ultimate multi-purpose WordPress business theme. The customization options are endless, yet, you can pick from tons of available demos, import it with one click and you are almost ready to launch. There are all sorts of features that TheFox comes with, including premium plugins for free. But most importantly, the Visual Composer allows you to build a beautiful website without any coding knowledge. A programmer or not, everyone can create with TheFox and bend visitors’ mind with the outstanding web page. There is so much you can do with RT-Theme 17 and its powerful CMS features and tools. You can easily create a website for any type of business you are into. Whether it is a product catalog, you sell services, need a compelling portfolio, all that and a ton more is what you can do with RT-Theme 17. The theme is well documented, offers video tutorials and how-to’s which will guide you and get you closer to bringing your business on the world wide web. Don’t sit on it, use all that to your advantage and get creative. 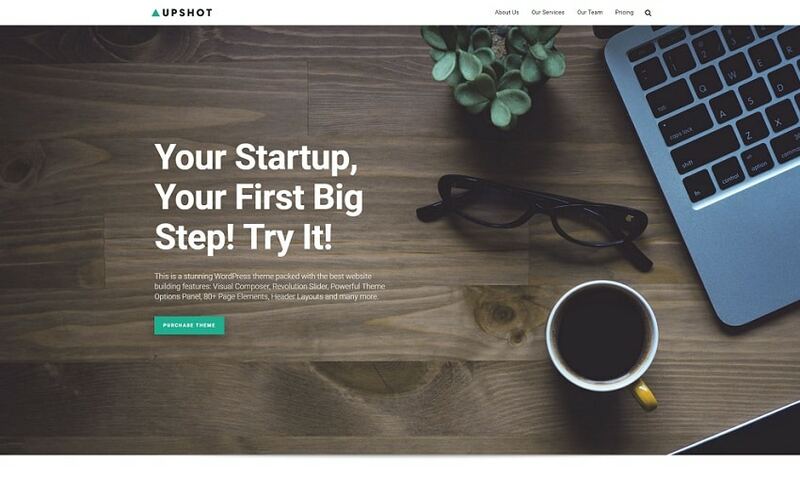 If you own a small business or are a creative professional selling incredible work, give Upshot a shot. 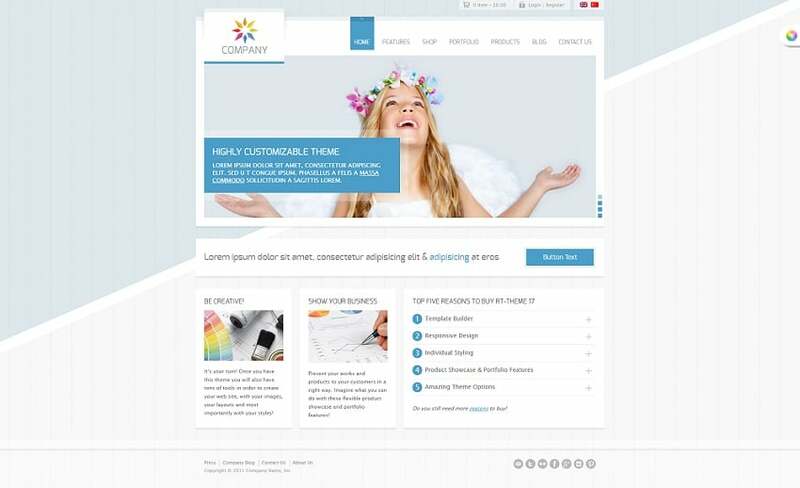 It is a very flexible and multi-purpose theme that will fit your biz perfectly. It comes with 10 unique homepages, complete with inner pages that will help you launch a website for your offerings without the extra hassle. Customizable header, revolution slider and the popular drag and drop page builder will help you play with the features and ensure you to have a ton of fun creating your next masterpiece. 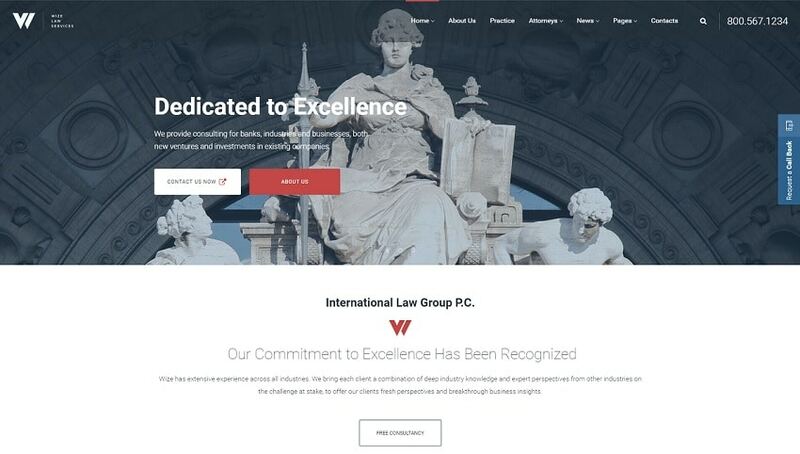 For everyone who is the law services field, a private lawyer or a legal adviser, boy do we have a WordPress theme for you. WizeLaw theme is super wise and will help you promote your business online by allowing you to create a stunning and functional website with ease. No need to pay a whole bunch of money for the website, you can now do it all on your own for as cheap as possible. GT3 page builder modules that are integrated into the Visual Composer page builder help you customize the theme to your preferences effortless. No need for excuses anymore, it’s time to get online now. 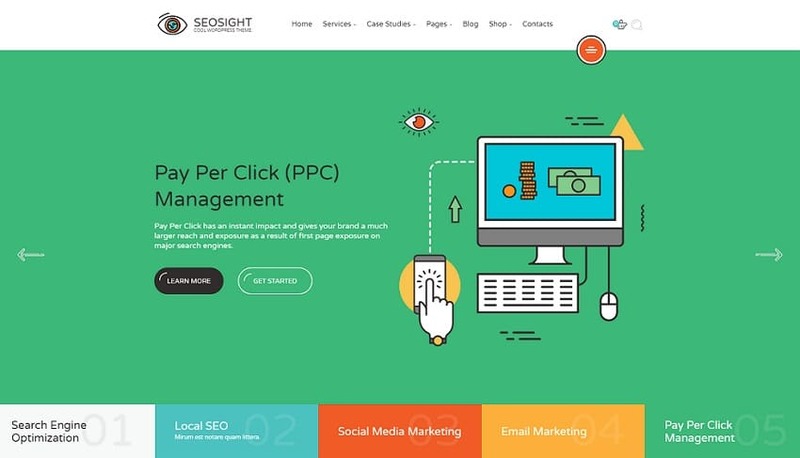 With search engine optimization (SEO) and digital marketing agency in mind, Seosight was created to fill this niche. Like they say, “This is a unique and creative solution for your projects.” Do we even need to mention that this WordPress business theme is fully SEO optimized? Its fully responsive and retina ready design along with its clean look will help you create a wonderful website that will look beautiful on every device. You get exclusive sliders and animated blocks and elements that allow you to launch a one-of-a-kind web page for your business. You should have no more excuses. Getting online could not be simpler. Pick your favorite WordPress Business theme and start gaining new customers and clients for your business. Great roundup. Handy. Thank you! Thanks for sharing amazing theme list. I would like to recommend one more theme which is business related and it is Biznetic WordPress theme. It contains various features like WooCommerce compatible, Translation Ready, SEO Friendly and stunning design can be used for any purpose.